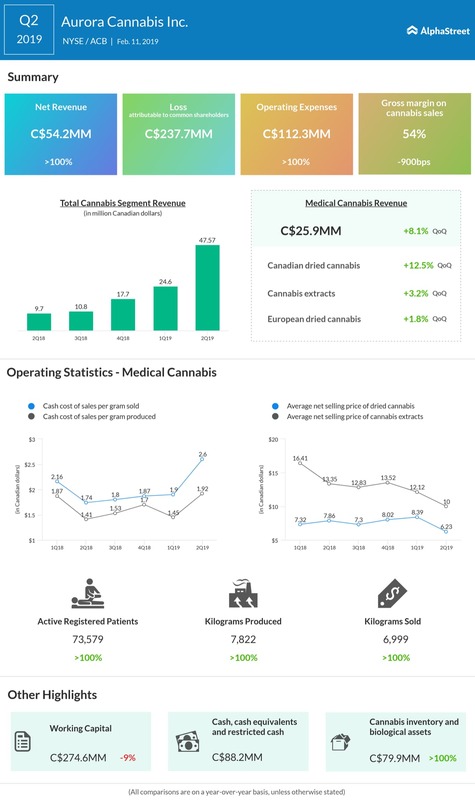 Aurora Cannabis (ACB) on Monday reported a loss of C$238 million in the second quarter of 2019, compared to a profit of C$7.7 million in the year-ago quarter. Net revenue of C$54.2 million was up 363% year-over-year and 83% sequentially. Here are the key management comments from the earnings conference call. You may listen to the entire call here. Chief Corporate Officer Cam Battley: We are committed to and have continued to grow our patient base since our last update by nearly 10% to over 73,000 patients across Canada. We are commencing some 40 clinical trials and medical case studies, besides seven pre-clinical studies. The federal government brought in a 10% excise tax on cannabis sales. Unlike any other prescription medication sold in Canada, medical cannabis stations are taxed for access to their treatment. Aurora disagrees with this practice and we’re not collecting tax from our medical patients, but rather are absorbing the cost. In Q2, we paid close to $3 million in excise tax related to medical cannabis sales. In addition to our investment in Alcanna, which operates North America’s largest chain of non-government owned liquor stores, we are targeting a large number of retail outlets across the country. We expect to see a further increase in product available for sale for fiscal Q3 and we’ll continue to accelerate production. We anticipate having approximately 25,000 kilograms available for sale in our Q4. Aurora’s presence now spans 22 countries on five continents. The average net selling price of dried cannabis and cannabis extracts decreased to $6.23 and $10 per gram respectively, as a result of lower wholesale pricing in the Canadian consumer market and the introduction of the excise tax. CFO Glen Ibbott: We expect future production cost to go down as Aurora Sky is producing at its full capacity. We expect cash cost to produce will fall to well below $1 per gram at Sky’s cost facility. Going forward, we expect our sales and marketing expenses to increase as we build out medical sales and marketing capabilities into our international markets. Cam Battley: There’s no shortage of cannabis in the world, but there is a massive shortage of legal regulated cannabis. Particularly cannabis that can achieve cannabis products that can achieve EU, GMP certification. We’re going to be focusing primarily on the higher margin medical markets and also on the higher margin products. My anticipation is, that a lot of European markets at least initially will be extremely keen on non-flower forms cannabis products. So that will be a contributor to our overall sales from derivatives as well. CEO Terry Booth: The process for EU GMP certification for the Sky facility has started. So our internal term from the EU have been through Sky, they have some recommendations for us and we expect to be ready, once we get into full production. So it is not too far.